Letâ€™s kick off the holiday weekend with some really innovative design. 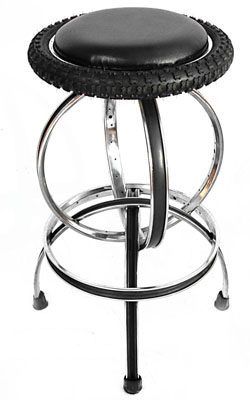 Today I bring you Bike Furniture.Â It doesnâ€™t need much explanation, as its name pretty much says it all. But, Iâ€™ll give you one anyway. 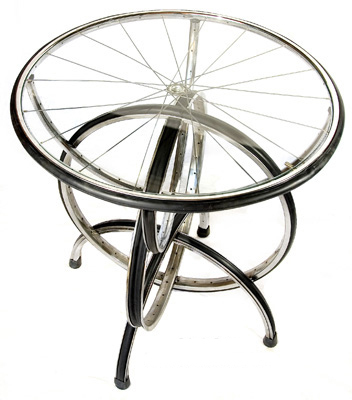 This collection of truly unique furniture comes from Bike Furniture Design, a design and manufacturing studio that specializes in turning recycled steel and aluminum bicycle rims, handlebars and frames into modern furniture.Â These designs are completely different from what I think of when I think modern furniture, yet I think some of the pieces could be perfectly integrated with other modern furnishing and dÃ©cor. Iâ€™m always impressed by items made from recycled parts.Â Sometimes even though they are green and innovative, I canâ€™t see how they’d fit in with everyday items. 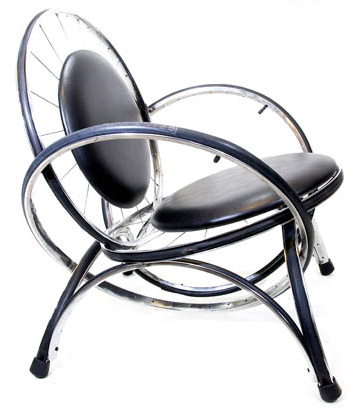 Thatâ€™s the difference I see in this collection, its green, innovative, and I could defiantly see mixing a chair or two in with my own dÃ©cor. Be sure to check out their site here.